To celebrate the extended run of "Empire Skate: The Birthplace of Roller Disco," and as an homage to Empire's legendary roller disco parties, The City Reliquary has organized a late-night skate at Hyde Park Roller Magic. 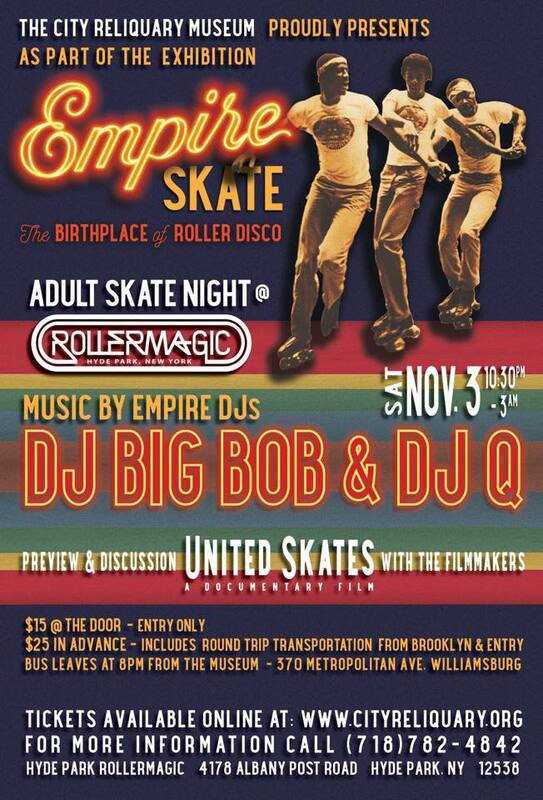 Join us for a sneak preview of the skating documentary United Skates followed by skating til the early morning hours. United Skates, a 2018 Tribeca Film Festival Audience Award winner, reveals close-knit skating communities across the country and their fights to save local rinks from closure and to preserve these hubs of African-American culture. Co-director Tina Brown and documentary participant Reggie Brown will screen clips and discuss the film. Then, Empire legends DJ Big Bob – a keystone of the Empire sound for almost 2 decades - and DJ Q spin soul, disco, and R&B hits to get the Brooklyn bounce going! Tickets include round-trip bus transportation from Brooklyn to Hyde Park Roller Magic. Buses will depart from the City Reliquary (370 Metropolitan Ave. Brooklyn) at 8 p.m. Hyde Park Roller Magic is located at 4178 Albany Post Rd, in Hyde Park, NY.